Happy Friday sweet friends! Fall is one of my favorite seasons. I love every tiny bit of décor, and pumpkin scented candles, it gets me all excited and in the holiday spirit. So, in honor of the season, I thought I would share my tablescape for this year. I've partnered with The Container Store to bring you some fabulous (and easy) DIY's for your upcoming holiday celebrations. Today I'm bringing you my doable festive tablescape! There is something so fun and festive about arranging a table. 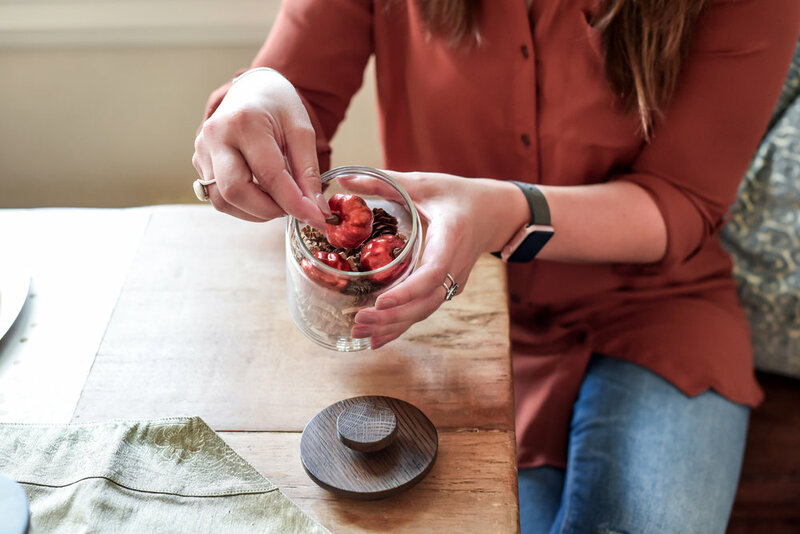 I love all of the layers, levels, and textures, and I also love any excuse to pull out my favorite dinnerware and servingware for the season. This year I wanted to use white pumpkins, mixed metallic, browns, and fresh greenery to create a beautiful and elegant fall tablescape that felt comfortable and still really unique, too. I'll take you through exactly how I did it, and how you can too, below! I started my tablescape designing by using The Container Store's fun gold confetti paper placemat pad as the base of each of the place settings. You can really use this design for so many occasions and the thick paper construction stands up to a meal but is easy to replace and not feel guilty about throwing out. I might even use them as placemats for New Year's Eve, too. I always love to give my guests that come over small gifts just say how much I am thankful to have them in my life. During the holidays, I make the gift a part of the tablescape presentation, and The Container Store has always made it easy to tie a gift and a look together since they have almost every style, color and shape of gift box, bag and container to choose from. For this giftable box, I used white small gift boxes as the base of the gift, then tied each with a simple bow made from thick gold ribbon. I finished off the look with pinecone gift tags, wooden clothespins, and this fabulous antler embellishment just to add some fall details that looked great on the table but also together with the gift. Next, I tackled the little details surrounding the what would become the centerpiece of the table. I added confetti filled containers which accented the pumpkin motif without going overboard on the concept. To decorate the containers, I used the Artisan Glass Containers with Walnut Lids and filled each one with The Container Store's Kraft Crinkle-Cut Paper Shreds and some miniature metallic pumpkins. 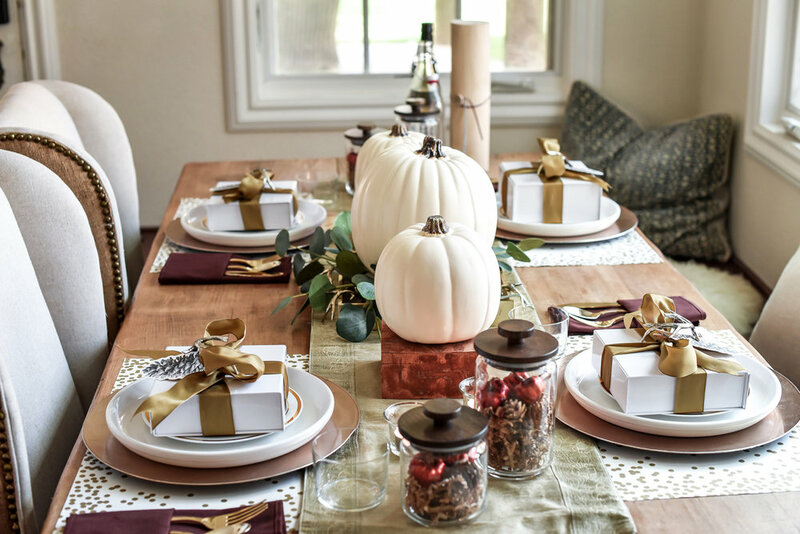 I think it really added a little fall touch around the table and still allowed me to reuse the glass canisters for myself after all was said and done. The centerpiece is always just that, the center of the look and the style of the tablescape. 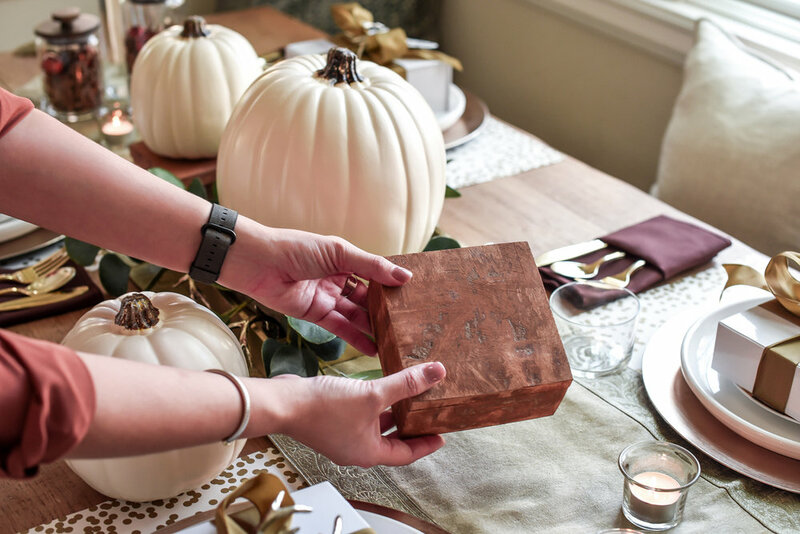 To create the centerpiece, I used a gold square lacquer serving tray and holiday cinnamon boxes (fun fact: they're actually made of cinnamon and smell incredible) to create levels to the look. Creating levels of varying heights really diversifies the look for a more interesting centerpiece. I used greenery inside the tray and added white pumpkins as accents across the golds, browns, and greens. 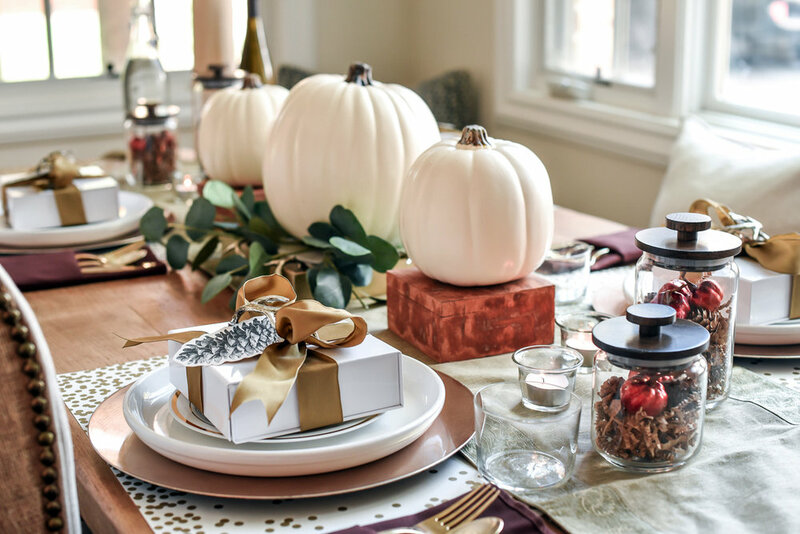 I absolutely fell in love with The Container Store's silver antler embellishments (as noted earlier) and tucked them into greenery to add that little details that make the tablescape pop. Once you start packing up the presentation, you can also use the antler ornaments as embellishments on your gifts.